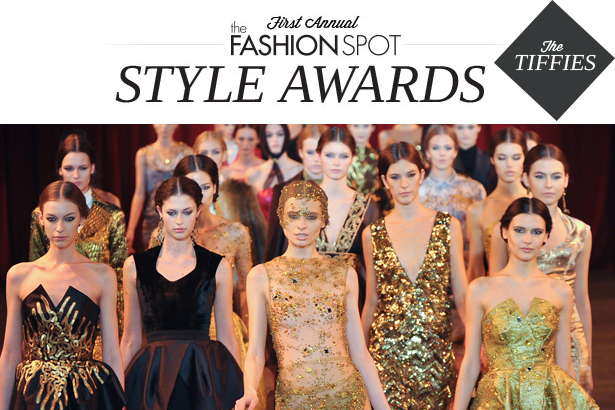 Presenting: The Winners of the First Annual tFS Style Awards 2013! We're thrilled to announce the winners of the first annual tFS Style Awards (the Tiffies)! Nominees were selected by the tFS forums, with voting open to the public. Since 2001, theFashionSpot's invitation-only forums have been a platform for the Internet's largest and most influential online fashion community, one which prides itself on strict community guidelines and informed, thoughtful discussion on every aspect of fashion. Most members choose to remain anonymous, adopting a tone that's more discriminating and honest than the industry standard. As Business of Fashion put it in an editorial published earlier this year: "In a fashion mediascape dominated by sugar-coated coverage (often carefully calibrated by public relations companies) this kind of honesty can be uniquely valuable, not least to designers seeking candid feedback on their work." Like the tFS Forums, the Tiffies are independent and democratic, representing the best of our community and the broader fashion industry. "I feel that it's very sincere," said designer John Patrick when he found out that his label, Organic, had won the Honorary Award for Ethical Fashion. "It's really transparent, there's no way for anyone to try to influence the results. For us, it was a complete surprise. And at the end of the day, in an industry that has its ups and downs, an award like this is very meaningful." Thank you to all of our readers who voted for the awards. Read on to see the full list of nominees.